As many as 107 documents on the life of Bhagat Singh have come to light. Out of these, 45 documents fall in the category of correspondence — letters, telegrams and notices/leaflets. Bhagat Singh’s correspondence is available from 1918, when he had not even turned 11. There are four notices and three telegrams in the 45 documents. Out of the 38 letters, 15 are personal in nature, and 23 fall in the political category. The first five available letters of Bhagat Singh were written between 1918 and 1921, when he was 11 to 14 years old. Another set of 10 personal letters was written from jail during 1930-31. In 1923, when Bhagat Singh was 16, he wrote his first ‘political’ letter to his father. Between 1927 and 1931, more than 20 letters were written, including one written just a day before his execution. This period in Bhagat Singh’s life impacted him the most, turning him into a mature freedom fighter. The notices, though just four in number, have great significance. The first notice was pasted on the walls of Lahore, in the intervening night of December 18 and 19, 1928. The notice was drafted on December 18 by Bhagat Singh, but issued in the name of Balraj, commander-in-chief of the Hindustan Socialist Republican Army (HSRA), the military wing of the Hindustan Socialist Republican Association (HSRA). Balraj was the pseudonym name of Chandrashekhar Azad. Both wings of the Hindustan Republican Association (HRA) were rechristened HSRA on September 8 and 9, 1928, at Ferozeshah Kotla grounds in Delhi. This notice was pasted after the killing of J. P. Saunders, Deputy Superintendent of Police, Lahore, on December 17 in broad daylight, in front of the SSP’s office in the city. Saunders had ordered his men to hit Lala Lajpat Rai with lathis on October 30, 1928, when the latter was leading a large procession against the Simon Commission. Lala Lajpat Rai died on November 17 and the HSRA decided to avenge this ‘national humiliation’. Exactly a month later, Saunders was killed and this notice appeared on the walls of Lahore. The notice was handwritten by Bhagat Singh and was later produced as an exhibit in the court. The notice declares in bold letters —"J.P. Saunders is killed; Lala Lajpat Rai’s (death) is avenged." The text of notice says: "Really it is horrible to imagine that so lowly and violent hand of an ordinary police official, J. P. Saunders, could ever dare to touch in such an insulting way the body of our (leader) so old, so revered and so loved by 300 million people of Hindustan and thus cause his death. The youth and manhood of India was challenged by blows hurled on the head of India’s nationhood." The subhead of notice reads: "Beware ye tyrants; beware." The notice warns the British not to "injure the feelings of a downtrodden and oppressed country. Think twice before perpetuating such a diabolic deed." The third subhead says: "Long live revolution." This section states: "Sorry for the death of a man. But in this man has died the representative of an institution, which is so cruel, lowly and so base that it must be abolished. In this man has died an agent of the British authority in India — the most tyrannical of government of governments in the world." The last paragraph of the notice reads: "Sorry for the bloodshed of a human being; but the sacrifice of individuals at the altar of the revolution, which will bring freedom to all and make the exploitation of man by man impossible, is inevitable." Then twice comes "Inquilab zindabad." The socialist thought of the HSRA seems evident in this notice. The colonial government has been perceived as the most tyrannical government of the world and Saunders identified not as an individual, but as ‘representative of an institution’ — the institution of colonialism and exploitation. The ‘death of a man’ has been regretted, but in the death of this man, the death of the colonial system had been wished. The second notice on the same incident was issued on December 23. It again carried the name of Balraj but was actually written by Bhagat Singh. The killing of Saunders was justified. "This was a revenge for the biggest national insult" that came in the form of an attack on the grand old man of India, Lala Lajpat Rai. The killing was also justified as per "the rule (10-b&c) of the HSRA". The slogan "Inquilab zindabad" was repeated in this notice as well. It seems the HSRA had given a serious thought to the adoption of this slogan as well as "Samrajyavad murdabad" (death to imperialism), which reverberated in the Central Assembly in Delhi, four months later. For Bhagat Singh, the political purpose of the slogans was to arouse people’s emotions. Earlier the slogan "Vande Mataram" was used. The freedom fighters thought that a new slogan was necessary to arouse people. That is why all the three notices issued by the HSRA prominently focused on these slogans. The two slogans, drawn from the Bolshevik Revolution of Russia in 1917, suited Indian conditions perfectly and caught the imagination of the people in no time. The third and more elaborate political notice/leaflet was printed and thrown in Central Assembly on April 8, 1929, by Bhagat Singh and B K Dutt, after harmless bombs were exploded in the Assembly. They quoted French revolutionary Edouard-Marie Vaillant — "It takes a loud voice to make the deaf hear" — to justify their action. The leaflet refers to the repressive measures adopted by the British regime, particularly the Public Safety Bill and the Trade Disputes Bill. The leaflet refers to the Hindustan Socialist Republican Association as a serious and responsible body which had decided to stop "this humiliating farce" and not let "the alien bureaucratic exploiters" do what they wished. Instead, the HSRA wanted them to "come before the public eye in their naked form". 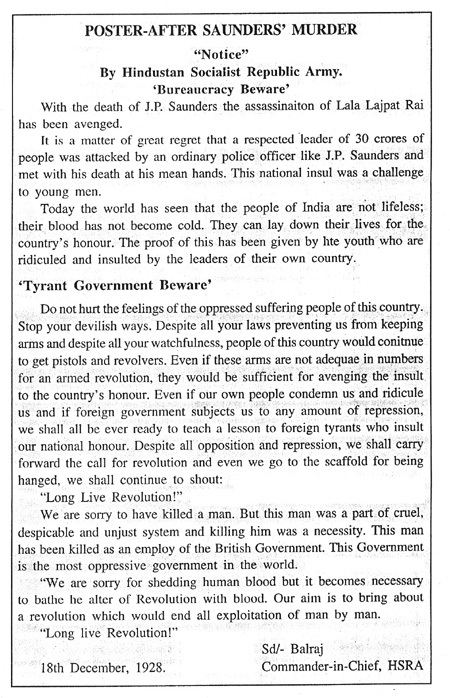 The leaflet again refers to "the callous murder of Lala Lajpat Rai" and declares that "it is easy to kill individuals but you cannot kill ideas. Great empires crumbled but the ideas survived. Bourbons and czars fell while the revolution marched ahead triumphantly". This is a clear reference to the French Revolution of 1789 and the Bolshevik Revolution of 1917. By far this is the most definitive political statement by Bhagat Singh and his associates about the power of ideas to arouse people. It is a clear break from the earlier quasi-religious approach of Indian revolutionaries to arouse people in the name of nation or religion against ‘foreign rulers’. Emphasis on "the sanctity of human life" has been asserted in the concluding paragraph of the leaflet, but the necessity of sacrifice of individuals has also been underlined. "The sacrifice of individuals at the altar of the great revolution`85 is inevitable." The leaflet concludes with the slogan "Inquilab zindabad". In fact, all three notices issued by the HSRA and drafted by Bhagat Singh, show that the revolutionary movement in India had taken a clear ideological position, akin to Lenin’s anti-imperialism stance. The fourth notice had been issued by Bhagat Singh on June 17, 1929, as life convict No 117 of Mianwali Jail. Addressed to the Inspector General, Jails, Lahore, it announced that he was on hunger strike from June 15 and had lost six pounds. By asserting himself as a "political prisoner", Bhagat Singh had enlisted his demands for better food, bathing facilities, availability of books/newspapers, etc. This notice shows how Bhagat Singh had matured as a political personality. Three brief telegrams also confirm the ideological positions adopted by the HSRA in these notices. On January 24, 1930, Bhagat Singh and other convicts of Lahore Conspiracy Case greeted Third International, an international Communist organisation founded in Moscow in 1919, on Lenin Day. They came to the court wearing a red scarf around their neck and shouted slogans like "Socialism zindabad", "Samrajyavad murdabad" and gave telegrams to the Magistrate, which was published in The Tribune of January 26, 1930. They sent another telegram to Hindustani Samiti in Berlin on April 5, 1930, condoling the passing away of Indian revolutionary Shyamji Krishan Verma. The third telegram was sent to the convicted in the Kakori case, who were on hunger strike in Bareilly jail. Sachinder Nath Bakhshi, Rajkumar Sinha, Mukundi lal and Manmath Nath Gupt were requested to end their hunger strike in view of the notification issued for classification of convicts in jail. There was another telegram sent by Bhagat Singh to the Home Secretary, Government of India, on January 24, 1930, drawing his attention to the fact that though the inmates had ended their hunger strike yet Congress leaders of the jail reform committee were not being allowed to meet them. 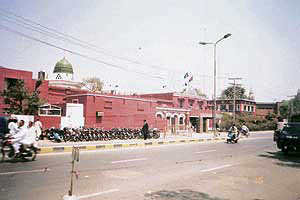 It is also stated that undertrials in the Lahore conspiracy case were badly beaten up by orders of police officials on October 23 and 24, 1929. Bhagat Singh’s correspondence makes for an interesting, unexplored and significant area of research in context of the Indian revolutionary movement.